Hip Length 100% Waterproof Pilot Style Jacket. 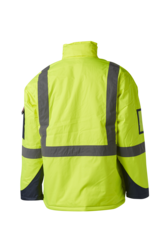 Lighter-weight poly padding with concealed collar hood and drawstring waist adjustment. Wrist adjustment straps on sleeves with multiple pocket design.